Action Express/Corvette DP score 1-2 finish at "Mosport"
Canadian Tire Motorsport Park, formerly known as Mosport Park, was the home of the Mobil 1 Sportscar Grand Prix, the seventh round of the 2016 IMSA Weathertech Sportscar Championship last weekend. The former host of the Canadian Grand Prix offered some exciting racing in just 160 minutes, which is how long the race lasted. All four classes, P, PC, GT-LM and GT-D, were present and made for some pretty tedious moments in traffic but, in the end, we got to see a partial repeat of the Watkins Glen scenario in the form of another 1-2 for Action Express Racing and another victory for the No. 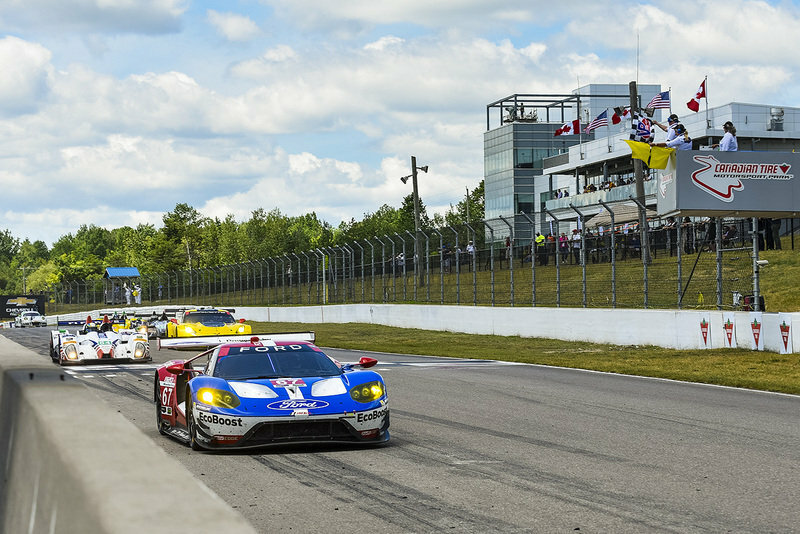 67 Ford Chip Ganassi Racing Ford GT — this time through clever strategy work rather than pure pace. Gloriously wearing the livery of the 1991 Le Mans-winning Mazda 787B, the No. 55 SpeedSource Mazda stormed to pole position, Tristan Nunez clocking an unbeatable 1:10:126, over 0.3 seconds quicker than the best Ricky Taylor could muster in the No. 10 Konica Minolta Wayne Taylor Racing Corvette DP. Pole position was not a new course on Mazda’s plate, the Multimatic-built, Lola-based, prototype sitting on pole for the first time at Laguna Seca this year. This time though, the margin was greater and spirits ran high in the Mazda pit box as a victory seemed within reach. It wasn’t even far fetched if we do the math: The No. 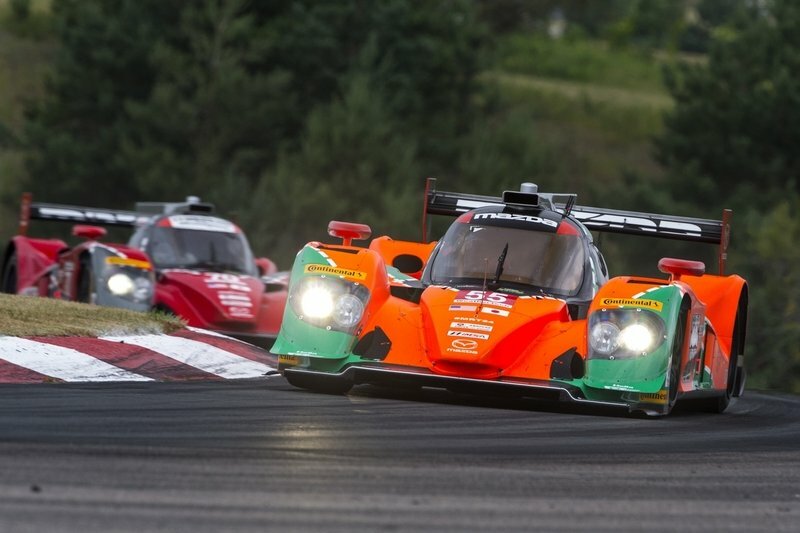 55 retired a little over seven days ago while running third at Watkins Glen after well over five hours of racing, whereas the race at CTMP (doesn’t Mosport sound 10 times better?) only lasts two hours and 40 minutes in its entirety. It should have been easy. IMSA decided the GT-LM status quo was a matter of force majeure and acted upon it in the week between the Watkins Glen and the CTMP rounds, a never-before-seen move by the sanctioning body. The Ford GT was thus pegged back while the Chevrolet Corvette and Porsche got some help. In numbers, the Ford GT got 33 pounds heavier while also receiving additional boost pressure limits. The Chevy got 22 pounds lighter, as did the Porsche and the American C7.R, also receiving a 0.4 mm larger air restrictor and a revised declared minim lambda. The Porsche did not benefit from these modifications and it mattered dearly during the Canadian weekend with the factory 991 GTEs being the only cars completely off pace. Up front, Corvette took the pole via a blistering effort by Antonio Garcia with the Spaniard putting the No. 3 car on pole for the first time since 2014. The next six cars behind were all in under 0.6 seconds while the two Porsches were at the very back of the pack, 1.2 seconds and 1.4 seconds, respectively, off the pole lap. It was a performance deficit that neither the No. 911 nor the No. 912 could claw back in the race, despite a gutsy strategy employed by one of the crews in a Hail-Mary attempt to salvage some points. Rolling starts are a very precise business and, last Sunday, Tristan Nunez didn’t get everything right as Ricky Taylor torpedoed past him to slip up into first as the Prototype field went through Turn 1. Corvette’s Antonio Garcia didn’t indulge himself in some napping as the lights went green and he kept first, as did GT-D pole-sitter Alex Riberas. Colin Braun did not start from pole in Prototype Challenge as CORE Autosport elected to use Jon Bennett for the start which, in turn, meant that the No. 54 car would start last – no biggie for a team that won the title in this category a record three times in the American Le Mans Series. Nunez still managed to tip-toe his way past the WTR Corvette and went on to build a comforting gap of over 12 seconds by the time he peeled into the pit lane for what was the first pit stop. Then, disaster struck (again). The front air jack malfunctioned and the team had to use a usual jack to get the car off the ground. This cost the Speedsource team valuable time and dropped the car down to fifth. It would claw its way back to podium contention, being involved in a very hairy moment down in turn two when Johnathan Bomarito, after taking over from Nunez during the second pit stop, went three wide with the No. 31 Whelen Action Express Racing of Dane Cameron and the No. 5 Action Express Corvette of Christian Fittipaldi. Cameron had pitted the lap before and was still on cold tires but, despite this, managed to jump past both his team mate and the Mazda. Bomarito didn’t see much racing action though as, with one hour and 25 minutes still to go, he parked the car with rear-right hub failure. Sadly, the surviving No. 70 car of Tom Long and Joel Miller never showed much promise during the race and went on to finish a lonely fifth. With the only LMP2-based threat out of the way, the Michael Shank Racing car took itself out of contention after John Pew spun the car following a close-quarters moment with a PC. It was now all about the DPs at the sharp end of the field. The middle stint was all about the VisitFlorida.com Racing Corvette but this car, in the hands of Marc Goossens, lost the lead to Eric Curran with less than an hour to go, Curran duplicating the work of his team mate by moving at the head of the field where he stayed until the end with team mate Barbosa having a hard time getting by Jordan Taylor which meant he had to settle for second. The No. 90 finished fourth, as its alternate strategy did not pay off. The Ligier meanwhile also got a penalty late in the running which meant the car only finished eleventh. The DeltaWing had a forgettable outing as well, Sean Rayhall going off track at some point towards the end before rejoining. The Prototype Challenge class was all about CORE Autosport’s return to form. After taking the pole, the car started from the back but carved its way up to the front. The climb wasn’t completed easy though as Stephen Simpson put in a monster two-hour-and-twenty-minute-long sting aboard the No. 85 JDC-Miller Motorsport Daytona-winning car, most of which he spent in the lead. The car only lost 1st position when Misha Goikhberg got in the car, Simpson’s team mate only driving for the last 20 minutes because he had to visit his wife in the hospital who was delivering their baby. The emotional Goikhberg could not properly concentrate on racing and, as such, lost several positions and only came home fifth. Renger van der Zande made the best out of JDC Miller’s situation and finished second behind Braun. Robert Alon crossed the line third, a solid result for the PR1/Mathiasen Team while Kyle Marcelli finished fourth for Performance Tech Motorsport. Corvette Racing’s Antonio Garcia led the way in the opening stages in GT-LM, the Velocity Yellow-colored machines finally running at the sharp end of the field after a very long dry spell. It was to be a battle between Corvette, Ford and BMW – the latter being the quickest. In the end, Ford won again thanks to a different strategy employed by the No. 67 crew of Richard Westbrook and Ryan Briscoe. The car started third and really flew off in the middle part of the running. The secret? Three stops, the last for fuel only, as opposed to two for most of the other cars. They knew they had the fuel efficiency and with Briscoe aboard for the finish, degrading tires did not prove to be a problem. The Indycar star left the pits for the last time with a cushion of 11 seconds over the No. 4 Corvette which had skipped past its sister car after a successful undercut at the last stop. Tommy Milner had fresher tires and did claw back five seconds but that was far from enough and Ford finished first for the third time in succession (also the third time for this crew). As Milner finished second, him and Oliver Gavin still hold a slim five-point lead over Westbrook and Briscoe in the drivers standings. The pole sitting Corvette came home third, ahead of Rahal Letterman Lanigan Racing’s BMW M6, which had immense pace but could not get track position being caught at the wrong time by the first full course caution (which was not the case with the winning Ford). The first caution was caused by Alex Riberas’ Porsche which lost a wheel. Ford’s other car finished fifth after a slow first pit stop while the sole Ferrari of Risi Competizione finished an anonymous run in seventh, behind the No. 912 Porsche which had run as high as third after trying out the same kind of strategy the winner used. Sadly, the Porsche lacked the pace to keep its track position and fell from third to sixth. Le Mans-winner Nick Tandy finished a frustrating eighth, but it was an even more frustrating outing for the No. 100 BMW as it finished dead last with power steering problems hampering it down. Alex Riberas was the class of the field early on in the race in GT-D, before losing time during the second pit stop and losing even more after the left-front wheel got detached. This cleared the path for Jens Klingmann’s Turner Motorsport-entered BMW M6 GT3, but it wasn’t an easy victory for the German as he had to battle Ben Keating’s rejuvenated Viper and Fabio Babini’s Lamborghini. Ultimately, Klingmann got by the two of them as they clashed, Bleekemolen peeling into the pitlane for an unscheduled stop due to the damage inflicted to the front end after clipping the rear of Babini’s Huracan. Babini also had to pit, but for a scheduled stop, as he was on a different strategy. This meant that second went the way of Stevenson Motorsport’s No. 6 Audi R8 of Robin Liddell and Bret Curtis who had so much bad luck last time out at The Glen. Bryan Sellers and Madison Snow saved Lamborghini’s reputation by finishing fourth as the championship-leading Scuderia Corsa Ferrari came home fourth after clever pit strategy brought the car up through the field despite it lacking pace. Fifth was another Lamborghini, that of Change Racing, whilst Porsche’s best finishing cars were in sixth and seventh – quite low for a manufacturer that, a decade and a bit ago, made up the numbers in the ALMS GT category. 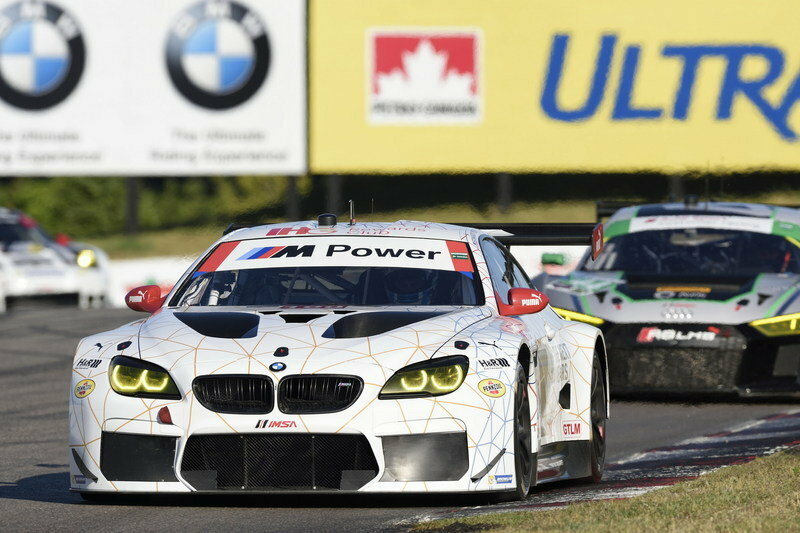 With the Mobil 1 Grand Prix now wrapped, next up is the Limerock Park round in Connecticut on July 23rd.